When the issues of the Black community arise, so do the clergy. Whether they don the title of pastor, reverend, bishop, apostle, prophet or evangelist, they all play a significant role in the culture of Black leadership. The most recognized in Louisiana are the Rev. Ted Jameson, Rev. CS Gordon, Rev. Joe Green, and more recently the Rev. Errol Domingue—but there are so many more clergy who go unrecognized for their added community leadership roles and constant sacrifice. Apostle Lue Russell, D.Th. is one of those leaders–in the pulpit and in the public. She is a passionate and lionhearted Christian whose small but robust stature fits her personality and her works. 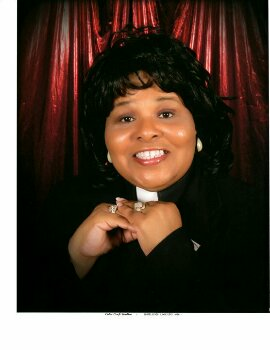 She is pastor and Executive Overseer of Ministry Fellowship at Hearts of Fire Ministry in Hammond, LA. Don’t let the lengthy title fool you, she is as real and sensible about her philanthropies as they come. Arriving at her 10th pastoral anniversary this May, her projects show the fruits of her work beyond her decade in the pulpit. She has publicly fought for equality, justice, and change within Louisiana’s Black community. She was born about an hour north of Baton Rouge in Tunica, Louisiana, but raised here in the capital city. Russell also has roots in New Orleans, LA, having earned her bachelor’s and master’s degrees at Xavier University and doctorate of theology at Trinity Christian University. While these are great accomplishments, it is her conviction by God that put her on the path she is now. Russell is an active member of People Improving Communities through Organizing (PICO), a national faith-based community. She constantly referred to this great organization and touts the practices it employs to be a great way to engage the community. It’s not just a Christian based group—the clergy of any faith are welcome. Non clergy interested parties and, grassroots community leaders are also welcome. Through and with PICO, Russell focuses on major issues like childhood obesity and mass incarceration that plague the neighborhoods of Black communities in Louisiana. She served as an event organizer with the Center for Health Organizing, under PICO. This branch of PICO commissioned an interesting study through Southern University College of Social and Behavioral Sciences in February of this year. The research involved measuring the statistics and practicality of the relationship between the health of children (childhood obesity) to mass incarceration. The final report produced from the study is titled “Structures of Inequality: Race, Incarceration and the Health of Louisiana Children.” If the first three words of the report didn’t make it clear enough, the findings were bleak. Russell said “many of the injustices and ills of our community are directly related to policies that are racially motivated to continue the divide between the haves and the have-nots, based mostly on skin color.” But instead of inducing a sense of defeat, these findings stir leaders like Russell to take massive action. She is gaining support from national funders and building local civic engagement. Her simple request is that we stay tuned and know that she needs our help. The age of social media creates huge followings and can provide ample exposure for events and projects. However, Russell admits she has neglected this avenue of seeking support. Perhaps it’s the generational difference of meeting people face to face and contacting others through email, phone calls, and personal introductions. But she’s learning and catching up with the times. Her social media accounts can have a great impact in reaching a broader group of Louisianans who don’t attend church or don’t directly know someone involved in the projects. She owned the critique and divulged that she hired someone to help with the social media aspect of her organizing the involvement. In 2013, there was a grave disservice to those who are to be protected by the Voting Rights Act, she said. The Supreme Court gutted Section 4 of the act, which provides federal oversight of the states who have historically been unfair in their voting practices, without replacing it with updated information the way they claimed it would be done. With 2015 and 2016 being important election years, Russell said, it is absolutely vital that we fight against the removal of Section 4 because the repealing of this section will detrimentally impact the communities of people of color in the country. But, how many people know about this? Russell said it certainly hasn’t gotten as much press as other high profile stories, like Obamacare or the Syrian civil war. This is an important aspect, and main motivation for the purpose of the SCLC this year.” “We will have a march Saturday morning with international presence and media to highlight, in Louisiana, the critical time to vote and be vigilant about (the) right to vote. And our theme for the conference is ‘We’ve come too far to turn back now’—I’m excited about this!” said Russell. The excitement in the 56-year-old’s voice when talking about the SCLC is contagious, and is what helps drive forward her efforts for voting rights. Russell calls for the individual within a group of friends who has grown to a point of maturity and exposure to the important issues in our community to step up. According to her, that individual is obligated to inform their circle and at least engage the others in the conversation. “My greatest fear is our younger people do not necessarily have a basis from which to relate to what I’m talking about. If we don’t find a way of engaging them, history has a way of repeating itself.” That history is not pretty. She said younger generations are extremely intellectual, and no one can take that from them. Russell is also involved with Baton Rouge Chapter of the National Congress of Black Women which she chairs. (NCBW meets monthly at the Main Library, 7711 Goodwood Blvd., on second Sundays.) She said women and men are encouraged to join regardless of race, age, religious affiliation, or cultural background. It may seem like Russell has a lot on her plate but all of her work moves in the same direction: towards civil engagement and voting encouragement. Whether the group or meeting she is attending is a congregation or the residents of the community, she said she wants it to be known that all races and cultures are welcome to ally with her and these organizations.